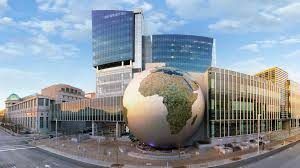 Event Description: A stimulating place to participate in a corporate teambuilding event, the North Carolina Museum of Natural Sciences — the largest natural history museum in the southeast — has been preserving the state’s natural wonders for 121 years. Its four floors of fascinating exhibits include the world’s only Acrocanthosaurus dinosaur fossil, a two-story indoor waterfall, and a Living Conservatory aflutter with hummingbirds and butterflies. During your corporate teambuilding treasure hunt… expect to encounter Willo the Thescelosaur; a giant blue whale; naturalistic quotes from Aristotle, Darwin and Shakespeare; and more exhibits than you can shake a snake at.